Apple iPhone storage is an issue. If you’re like me you chose to tough it out with the 16GB version, rather than fork over the extra $100-$200 for more storage. The result leaves you with an ongoing battle to actively manage your iPhone’s storage capacity. Sure, the free 5GBs Apple iCloud gives you is nice, but it’s not enough. You end up deleting photos and videos to create room for the same type of media. Google Photos can solve this problem. They will automatically back up all your photos and videos for free. Google Photos allows you to store an unlimited number of files, at a resolution up to 16 megapixel or 1080p video, for free. The setup is easy and the photos and videos on your iPhone will sync effortlessly in the background. 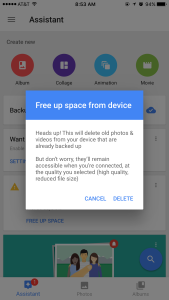 While unlimited storage is this service’s biggest draw, it’s the other aspects of Google Photos which make it worth keeping. The “Assistant” in the Google Photos app is one of the smartest features I’ve seen. It prompts you if your iPhone is running out of storage and then offers to free up space. 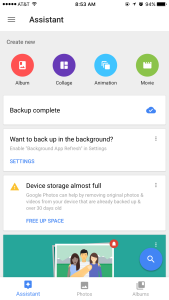 Assistant does this by deleting photos and videos, over 30 days old, which have already been backed up to Google Photos. This eliminates the need to manually delete photos on your device. Assistant not only helps with storage management, but can organize your vast photo collection just as well. 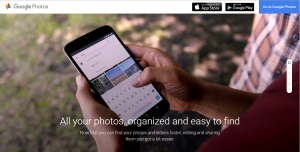 It will categorize your photos by places, things (screenshots, selfies, cars, etc. ), and people. I was surprised to see how well Google was able to sort my photos by individual faces. As you would expect, there is also the option to create albums, collages, animations, and movies. In my opinion, Google Photos is one of the best photo storage and management applications around. It provides effortless and efficient photo and video syncing with features not rivaled by other photo services. The unlimited storage feature makes it hard to justify paying for any other photo management service.